New media: How we show what we know in the digital age. This site presents a conceptual framework and tangible strategies for employing new media literacy as a tool for developing and assessing complex learning through performance assessment. Traditional text-only forms of writing (essays, short response, reports, case studies) do not require students to use the new literacies of the digital age, nor do they organically require the higher cognitive functions that complex, multi-media digital artifacts demand of students. This site looks at the emergence of new media literacy and fluency, and challenges educators to move beyond one dimensional text-only performances in order to assess student learning. Through performances like web log portfolios, slide presentations, digital stories and visually differentiated text, students can demonstrate learning in ways that require them to analyze, synthesize, evaluate and *apply* what they know about a particular content domain. Today's pedagogical toolbox contains many new media tools that are inexpensive, easy-to-use and widely available. The new media forms addressed in this site are "low end" in that they employ common hardware, as well as easy to use and free or inexpensive software. As such they represent the media forms that students should be able to read critically and write proficiently today. But tomorrow is a different story. Media forms evolve rapidly, and we are still waiting for educational structures to develop that can recognize and support them within the context of teaching and learning. Part I. Conceptual and practical overview. Part I includes a brief overview of new media literacy in education, and then describes typical "low budget" new media products that students could and should be able to produce, and that teachers should be able to meaningfully evaluate. Being literate in a real world sense means being able to both "read and write" narrative in the media forms of the day, whatever they may be. Just being able to read them is not enough. Literacy = consuming and producing the media forms of the day, whatever they may be. For centuries this has meant being able to consume and produce words, through reading and writing, as well as listening and speaking. But because of inexpensive, easy-to-use, widely distributed new media tools, it now means being able to read and write a number of new media forms. Most of these forms fall under the heading of "the multimedia collage" because they integrate sound, music, still and moving images and other kinds of media, as well as text, into a single narrative. Beyond literacy is fluency. Fluency is the ability to practice literacy at the advanced levels required for sophisticated communication within social and workplace environments. The grammar and skills needed to read and create new media define the new edge of literacy needed to develop new media fluency. New media create new literacies, as well as new illiteracies. Blended literacies promote new media fluency. As new literacies emerge, traditional literacies like reading and writing text remain important. However, they are no longer the only literacies, nor even the default literacies for school work. Instead, the importance of traditional literacies is redefined as being part of an overall approach to communication that involves a number of media. The focus of well-rounded literacy expands from single literacies to include integrating traditional and emerging literacies. The focus of assessment shifts to assessing the parts in light of the whole, as well as the whole. New media fluency becomes sophisticated communication through the merging and integration of several media into new media collage form. New media literacy is also a revolution in form. Much of the information students consume in the InfoSphere is in story form. Yet what they are asked to produce in school is frequently in report or essay form. It is the particular challenge of the new media generation to combine the reflection and critical thinking of the essay, with the impact and emotional engagement of the story form. Teachers: be the guide on the side, not the technician magician. Assessment implications. Teachers can maintain their standards about content acquisition, while expanding traditional assessment approaches to include addressing process and content creation. They do not need to be technology experts. Instead, they need to bring to the assessment process their understanding of big picture issues, like context and quality, as well as their sense of applied knowledge and wisdom. As part of their own intellectual retooling, they need to begin experimenting with a wide range of new media in order to determine which new media tool and format best serves the educational interests of themselves and their students. A short movie can demonstrate a process, a short personal documentary can capture a mission statement, a web log can create an organic, integrated portfolio, and so on. The digital storytelling assessment site considers some of the nuts and bolts of assessment, as well as "media grammar," which can help non-technical teachers assess new media. Thus, we are transitioning from a text-based essay culture to a multimedia collage culture. Essay writing is still important, but so is being able to communicate in a number of media collage forms, including narrated reports, digital stories, blended blogs, movies and PowerPoint presentations. Art has become the Next R, storytelling has become a practical skill, and new media fluency is needed for sophisticated communication in a digital environment. As a result of the shift, art has become the next R, storytelling has become a practical skill and new media fluency is becoming a predictor of workplace success. Problems arise because often times teachers have not been trained to create non-text based media, and feel uncomfortable assessing it. Yet the world of work is looking for these skills that students are developing largely without our help. What is school is for? Students need to be able to write new media, and teachers need to be able to assess it. Until recently, every day media forms were text-based. No longer. Today they embrace the rapidly evolving domain of multimedia, often referred to as "new media." Within this domain, literacies and skill sets are born quickly because new media go from read-only to write-possible quickly (a phenomenon discussed in the next section). A plethora of simple, powerful, free or inexpensive digital tools (e.g., iMovie on the Mac and MovieMaker on the PC) make it possible for new media to evolve from a language spoken by the techno-elite to a language that can be spoken by anyone. New media forms are evolving faster than our understanding of the literacy skills and standards needed to support them. Students are developing the skills they need to create new media largely without help from schools. Teachers, under pressure to help students pass high stakes tests, are reluctant to require new media projects of students because they do not know how to evaluate schoolwork that is not primarily text-based. Literacy with new media is rapidly becoming insufficient. Fluency is the new goal. The meaning of literacy and fluency promises to evolve, whether schools recognize it or not. Once again, our learning institutions are not keeping up with the education our students are getting outside of school. The lag time between new media evolving from read-only to write-possible is shrinking dramatically. Historically, new media first appear to the vast majority of us in read-only form because it is controlled by a relatively few technicians, developers and distributors who can understand and afford them. The rest of us only evolve into writers once the media become easy to use, inexpensive and widely available. However, the lag time between reading and writing media is shrinking dramatically. From hearing to reading to writing text. Text was first spoken to the illiterate masses, who, after centuries of listening, learned to read. But it was still centuries before the average citizen was expected to be able to write. Compare this with TV. For the first half century of TV's existence, it had been read only – half the basic literacy equation – because it took a team of engineers and substantial financial backing to produce and distribute TV material. However, today anyone can create a quality "TV station" using nothing more than an inexpensive video camera and a broadband connection. Thus, fifty short years after TV became household fare, we can write it as well as read it. Web 1.0 – roughly 1990-2000: the web was a library and store with relatively few writers and merchants, and large numbers of readers and buyers. Web 2.0 - beginning roughly 2000: an interactive commons in which we all can collaborate and contribute. It is largely text-based, a comfortable medium for many, making it less threatening than we might suspect. Web 2.1 - beginning roughly 2008: Same as Web 2.0, except that it becomes noticeably and progressively less text-centric. Those who felt comfortable with Web 2.0 because of its text focus lose their footing. Web 3.0 - beginning roughly 2010: an intelligent, semantic ecosystem that inevitably we will all "write" by virtue of how we create content. Although web 3.0 is beyond the scope of this site, it behooves us to be aware of it now, given that it promises to change anything we do that is web-based - in other words, absolutely everything. Read-write web within everyone's grasp. Today, with just a little training, the least technical among us can create a basic blog – essentially an interactive website – in minutes. With a little experience, we can turn our blogs into media-rich information sources thanks to YouTube, SlideShare and other services that make it easy for the non-technician to store and show movies, presentations and other media. Like TV, the web is as ubiquitous as printed text and brings with it literacy pressures with very practical implications in terms of being educated and functional in the world of work. New media goes from powerful to empowering when we can write it, as well as read it. Increase in power. Common, inexpensive digital tools have enough power to enable the media literate to create quality movies, music, and more. They also have enough power to enable the media fluent to innovate, make a living and add significantly to the evolving intelligence base of humanity. Decrease in cost. Quality classroom media production can be accomplished with inexpensive or free software (like iMovie and Moviemaker) running on common computers using inexpensive peripherals, like cameras and scanners. What was out of range just five years ago is now within range in many schools and homes. Increase in diffusion, acceptance, ease of use. Creating quality new media is now common, accepted, sometimes expected, and much easier to do than it was even five or ten short years ago. In addition, centralized distribution channels have been supplemented by the highly decentralized Internet. Increase in furniturization. Digital tools are becoming intelligent furniture to those who grow up with them. First generation digital students feel at home not only with what is available, but also with new digital tools as they become available. 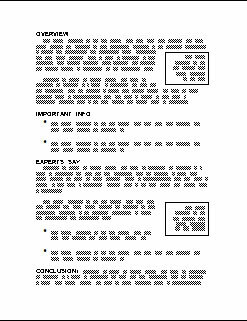 Word processing was a gentle foray into digital tools for conventional educators because they could use their traditional training to assess work that students produced. New media goes from powerful to empowering when it goes from read-only to write-possible. But the comfort zone disappears when using new media. Most teachers attended teacher education programs without a new media focus. They are confounded by new literacies, and the time demanded in developing them. As a result, teachers are understandably reluctant to require students to develop new media projects that they don't understand and can't effectively evaluate. Be the guide on the side, rather than the technician magician. They do not need to be new media fluent to do this, just literate. They simply need to be the guide on the side, not the technician magician. If the essay is no longer the default extended presentation format, what other options exist? The primary option is the multimedia collage. The multimedia collage becomes the new default format. Writing becomes one medium among many. The weblog becomes the portfolio notebook. Web page - the mother of all media collages. Consider the web page, that ubiquitous communication form that greets us each morning and travels with us throughout the day. The goal of creating web pages is to knit together text, graphics, music, animation and other media into a fluid non-sequential media collage. As with other media, most of us began just reading the web, but are now expected to be able to write it - or have someone do it for us. There is a general intolerance of web pages with inferior aesthetics and navigability that is reminiscent of our intolerance of essays that are disjointed and grammatically unsound. A few short years ago, building a web page was an ordeal. Today the average web surfer can create a weblog in minutes without training. But there are other common collages that are now a part of our lives, like digital stories and PowerPoint presentations, that are not only a subset of the multimedia collage, but are accommodated by the web. That is, no matter what kind of collage we create, we are probably going to use the web as our distribution and performance medium. 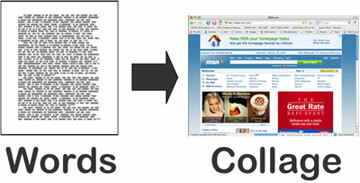 Specific kinds of "multimedia collages" are discussed in Part IV. Writing: often the invisible new media foundation. Writing is an important exploration and planning tool. While writing may not be the final product of a new media production, it is usually an important part of the process students must use to create new media. The saying "if it ain't on the page then it ain't on the stage" is just as true for digital storytelling as it is for projects created for theater and movies. Scripting for media is authentic writing. Media production is an effective way to engage kids in writing in an authentic way. Anecdotally I have heard from teachers that students who don't want to write school reports or essays are happy to write media plans and narratives because doing so is not perceived as "school work." Teachers call this “slipping writing in under the radar.” Those who are attitudinally predisposed to not like writing develop a taste for it as well as the ability to do so. Writing for new media compels the use of higher order thinking skills. The writing skills that students employ in the process of creating new media often embrace many aspects of writing that are considered important, both in school and in the world outside school. New media development compels students to synthesize creative writing and personal reflection along with the clarity and organization of expository writing. Writing fosters deep processing needed for new media development. The deep processing that writing is so noted for is crucial to the new media development process because it engages developers reflectively prior to their becoming immersed in potentially distracting media. No matter how sophisticated our technology becomes, the future of digital storytelling, movie making and other kinds of new media production will involve writing and conventional forms of literacy. Assess the writing students create to develop their media collages. We keep writing alive in the digital age by assessing whatever writing students use to create their media collage. This can include scripts, treatments, research, planning documents - anything that was created to help develop the project. As educators, it is our job to show parents and the public that new media development is an effective way to for students to pursue traditional literacy, as well as digital and media literacies. The understanding is that students are not giving up traditional literacies, they are simply refocusing and add to them. Teachers who help students create new media witness first hand the skill, insight, tenacity and growth students exhibit as they go through what is called in the media world, "the media production process." The value of the process is often immediate and overwhelming. The learning they undergo is broad, deep and obvious. But if you haven't witnessed students in the throes of media development, then you might still have questions about its value. This section provides some perspective on what new media development brings to the learning process. It is an exacting process, requiring students to work at the big picture and detailed levels, often simultaneously. Bloom's Cognitive Taxonomy. Bloom developed a taxonomy of cognitive stages that also serve as learning objectives for teachers creating learning experiences. As the stages progress from knowledge to evaluation, they can be seen as going from basic to sophisticated, representing increasing levels of intellectual development and utility. The media development process draws upon this progression of cognitive steps and mirrors them closely. Please note that I added two stages: creativity and publication. Bloom's taxonomy was developed during a time when the tools, pedagogy and social impetus for students to create original work were rather weak. Thus the highest rung in the Bloom ladder was evaluation. Fast forward to the digital age, when creativity tools are abundant, and the new ISTE standards promote innovation and creativity. The result is that the ability to create becomes an important high end cognitive function. Part of creativity is contributing to the social mediasphere by publishing what we create. While publication venues were sparse in Bloom's day, now they are abundant. Thus students are always actively creating and updating a portfolio, whether formally or informally, that is often open to the public. I also ask the question whether we need one more phase: cooperation, and further, if we do, where it should fit into the hierarchy. I believe what we are discovering is the limiations of a taxonomy. They are quite ordered and easy to follow, but don't embrace more lateral kinds of thinking in which a learner can be at more than one level at the same time. Correlating Bloom and the media development process. Bloom's taxonomy and the media development process correlate naturally. Planning begins here, perhaps by making a list of main events or important story components and arranging them in some sort of rough order. On a technical level, there is no escaping needing to know the keystrokes and other hardware and software details that are needed to be successful. On a content level, academic digital stories depend on a grasp of the facts and details related to the content being presented. That is, comprehension - the next step - begins with knowledge. From these details will emerge a storyline as students move through the planning process and the later stages of this taxonomy. On a story level, planning is in full swing here here. A common test of understanding is preparing a flow chart of an event, which is roughly analogous to developing a story map or story board. Retelling a story in one's own words is another common measure, and is an activity that happens rather spontaneously as students work out the details of their stories. On a technical level, one must be able to solve problems on the fly as they arise, which usually requires transferring an understanding of technical information to new situations. Students will spend hours troubling shoot in this way in order to problem solve. On a content level, the story will only succeed if it goes beyond a mere presentation of facts, and demonstrates an understanding of how the facts fit together and what they mean when related to one another. In the process, students must develop their own perspective, and tell it with an original voice. These two are presented together because they tend to blur into each other at this point in the course of creating a story. In the media development process, application and analysis correlate with certain portions of the planning process, as storylines are tested for congruency and meaning. But they are particularly present in Phases II and III, as students spend time examining their story in detail, deciding how to illustrate it, and then go about collecting and assembling the media they need to support their perspective and storyline. As I watch students of all ages create digital stories, I watch them wrestle with what they want to say and how they want to say it. As I listen, I hear the sounds of critical thinking, intellectual development and creative exasperation in high gear. Synthesis spans Phases II, III and IV of the media development process. The goal in the development of any piece of new media is, at its heart, the synthesis of a number of ideas and media into an integrated, seamless final product. With the story planning completed, students are focused on advanced stages of expression as they struggle to find unique ways to integrate the pieces of their stories together to form a unique, cogent narrative statement. This correlates with Phase IV and is roughly equivalent to formative evaluation. This is key for media developers, as they go through many iterations of a project in order to improve it. Often students have a difficult time letting their stories go because they keep seeing things they can modify to better express their ideas. The iterative evaluation process engages students as they develop and fine tuning of their ideas. Bloom's taxonomy was developed during a time when the tools, pedagogy and social impetus for students to create original work were rather weak. Thus the highest rung in the Bloom ladder was evaluation. Fast forward to the digital age, when creativity tools are abundant, and the new ISTE standards promote innovation and creativity figure prominenty, and the ability to create becomes an important high end cognitive function. This applies to all phases of media development. This is a direct result of Stage 7: Create. In the digital age, creativity does not happen in a vacuum. Presentation is very much about creating student work with an expectation of audience. Doing so raises quality standards, and expectations of public involvement. Again, in Bloom's time, there was very little opportunity for public involvement in terms of seeing or evaluating student work. Now, the venues for showing work on the web are copious, international and flexibile in terms of the kind of work they facilitate, including text, video, images, media collages and so on. This directly correlates with Phase V of media production. Add cooperation to Bloom's taxonomy? Should we also embed another stage within an update of Bloom's Taxonomy, called Cooperation or Participation? It makes sense to do so. Bloom's work is a bit old school in a few ways, one of which is that it assumes students learn and create assessable artifacts primarily on their own. In an era of social media, this is certainly no longer the case. Multiple intelligences are important in education because they are important in life. New media production appeals to many intelligences. Although the significance of “multiple intelligences” (Gardner, 1983) is often reserved for discussions of student learning styles within education environments, the reality is that we live in a “multiple intelligences” world outside school as well. The real world communicates using the intelligences that Gardner identifies. If this were not the case then they would not be so highly prized in education. New media production is a veritable cornucopia of intelligences, particularly if blended with the DAOW of literacy. Like traditional literacy, new media writing is widely applicable across the curriculum. Unlike traditional literacy, it taps skills and talents that might otherwise lie dormant within many students. Most of Gardner’s intelligences, from the linguistic and the musical to the kinesthetic and intrapersonal, are important in new media if we understand how to teach new media production effectively. It is our job as educators to deliberately include as many intelligences as possible in digital storytelling assignments. We need to do this not just to provide students an opportunity to engage the intelligences, but also to allow them to see how they are at work in the world of media. Books created illiteracy. New media updates illiteracy to include new narrative formats. The following is a short and by no means complete list of the literacies, fluencies, skills and perspectives that that have emerged within the context of a culture that can easily and inexpensively go beyond essays and create new media. The actual new media forms that students should know how to use are addressed in the next section. Art, the next R. Thanks to our struggle to use multimedia effectively, the language of art is taking center stage. New media requires us to be at least designers and managers of art, if not artists and producers as well. Yet, art remains a topic area, rather than a literacy, that is subjected to political and financial whims. This topic is covered in depth at the art the next R website. Oracy, speaking, presenting, performing, storytelling. Speaking, long considered a weak second cousin to reading and writing, is the third element of "the DAOW" of literacy and is now more important than ever. Delivering PowerPoint presentations, performing stories, delivering speeches, creating voice narratives for media projects are common and expected these days, although the literacies upon which they are based are not often addressed. More about this at the digital storytelling site. It is important to remember than any kind of oration can be recorded and presented fairly easily these days using YouTube or TeacherTube. Story development. While ancient, the story has particular utility in the age of information overload in terms of helping us organize and remember information. Story is also the information container used for much of the information that our students consume and create in the InfoSphere. This is addressed in depth on the digital storytelling site. Blending report and story. The goal is to harness critical thinking and emotional engagement in an integrated approach to presenting understanding. This new pedagogical frontier is addressed in the stories vs. report section of the storytelling site. Media Grammar. What makes media production work? Media grammar addresses the "run-ons and fragments" of new media, and is applicable for any teacher, regardless of content area or level of technical expertise. A basic guide to media grammar for the non-technical teacher can be found at the media grammar site. Technological and digital literacy. This includes being able to absorb new skills and shed old ones quickly. The attitude has become the attitude. This is addressed in depth in the section on digital literacy. Media literacy and Media fluency. Media literacy evolved primarily as a critical thinking skill set to help us read media, in particular traditional media like radio, movies and television. Media fluency evolved in response to our ability to write new media and our need to do so effectively. Both media literacy and fluency are important. More at the media literacy/fluency section of the storytelling site. The DAOW of literacy. While individual emerging literacy applications are important, their integration is more so because new media calls upon the employment of so many literacies in an integrated fashion. The DAOW of literacy addresses integrating digital literacy, art, oral literacy and writing into in the creation of new media. More about this at the DAOW of literacy site. Facility with a number of new media forms. These include but are by no means limited to visually differentiated text, voice-over narration, digital stories, blended weblogs, and PowerPoint presentations. They also include animation, games and immersive environments to a lesser extent, largely because they are not inexpensive or widely distributed - yet. But they will evolve rapidly and we need to be able to respond. Current new media forms are addressed in the next section of this site. If we accept that literacies emerge from communications forms that permeate life rather unnoticeably, then the multimedia environment of our tEcosystem indicates that being a fully literate person demands multimedia and new media literacy skills. Specific new media forms are addressed next. Most students will not go on to write essays in the workplace. But many of them will be required to be literate using a number of other forms of media expression. Some will require fluency in order to advance and assume leadership positions. Let's look at a few forms of expression that constitute the paragraphs, essays, reports and stories of our day. To do this, I will describe the work required of my graduate ed tech students to produce. bullets - using the bullet command in Word, blog editors, etc. boldface - boldfacing titles, etc. beyond monochromatic text - use text of a different color, but use it sparingly; avoid being "cartoony"
You'll notice that I use the 7 Bs throughout this website. Less can be more. Standard criticism of this approach is that the use of prominent formatting is an attempt to hide a lack of content. While this can certainly happen, I find the opposite to be true. A bullet surrounded by white space is a way of exposing the writer to scrutiny. Bullets demand focus and precision in order to withstand that kind of exposure. The result is that VDT challenges writers to sift, prioritize and hone language skills. Also, let's not forget that the uneconomical essay is just as bad in its own way. The fact is that VDT is prevalent text form. Web writing is very much in this of this kind. Our students need to be able to write like this and do so clearly and without sacrificing depth or articulation. Adding images. Adding images to text has the potential of reinforcing the narrative. Traditionally we think of reports and scientific presentations as needing images, rather than narrative that might be produced by students for Language Arts or history. But Images come in many forms, including charts, graphs, diagrams, photos, drawings, scanned images, to name a few. It can be helpful to require students to produce an image that depicts an idea in an essay. I am not an accomplished artist by any means, but produced the DAOW diagram shown here to help illustrate the DAOW of literacy. Media collage assignment: use one image and one page of text to tell a story. In my digital storytelling classes, often the first assignment is to tell a story with three paragraphs and one picture. The key is to align the two media, and make them work as an integrated whole, rather than treat the image as an add-on to the text. In the DAOW of literacy, O stands for oral literacy, or "oracy." Easy, inexpensive and effective. The narrated report or documentary is an example of a narrative-driven media form that is inexpensive and easy to produce. After all, it is a simple matter these days to talk into your laptop to record your voice. Adding images as well as titles to a piece using software like MovieMaker or iMovie (both free and easy to use) is a simple affair. For this reason, voice narrated media is a common, effective way to communicate that is rapidly rising in importance. Use video? Whether or not to use video is determined by equipment and time - video usually requires more room in the editing schedule. It is also determined by educational and literacy development objectives. Limiting video can increase the focus on written and spoken narrative, and decrease the focus on acting and movement. Up to you. Philosophy of education, by Ann Froescle. Basic but powerful, using no video or music. Education Philosophy, by Shywanda Royal. Uses music, candid shots. My Teaching Vision, by Darcy Sheena. Uses video, as well as still images. My Philosophy of education, by Karen Aleksa. Experimental, but powerful and artfully done. Video memos: short videos that typically use screen capture software to narrate a website or document that is on the screen. I call these "memos" because they are done quickly without much preparation. Yet, as we all know, memos can be a very effective communication form in certain circumstances. Typically these take the form of quick how-to videos made with screen capture software, like Snap Z on the Mac or Camtasia on the PC to explain processes, which records voice narration as it captures cursor movements on a screen. However, they can also be quickly shot video with a minimum of editing. Just in time, how-to demonstrations, software demos. Anything that is on the screen can be narrated, including how to use a website, software, etc. This could take the form of explaining how to use a particular website for a particular assignment. Assignment explanation. Teachers can explain the expectations of an assignment on the screen by scrolling through it, narrating sections they point to or highlight. Works well for documents or websites. Homework narration. Similarly, students narrate their projects while they are on screen, whether looking for feedback or as part of the final submission of their work. For example, I recently created a quick help file about how to store and publish documents via Google Docs for students. I posted it on YouTube, then emailed the class to tell them where to find it. Students can turn in similar assignments, in which they explain work they have by referring to on screen while offering voice support. Use video recording as well. Screen capture software is great for those things on your screen. But you can also use a video camera to briefly document a process or situation that is happening in your world. For example, suppose you wanted to demonstrate an understanding of the logistics of cooperative learning. You could video record a few minutes of showing how your classroom is set up, narrating as you shoot, explaining how the arrangement encourages cooperative learning. Be aware of permission issues with regards to showing students. The media development process is always present, however informal or abbreviated. Preparation. The media development process is always present in some form. In this case, it is very informal and abbreviated, which is all a video memo demands. Research takes the form of learning whatever it is that needs to be explained or demonstrated. Planning usually happens in terms of making a rough outline, and/or rehearsing the demo a few times to get a sense of how it ought to be presented. It is low in production values, typically using no titles, music or editing, yet is very high in terms of utility. Post video memos to TeacherTube for the entire class to use. The video memo can be a very helpful tool for teachers who find themselves explaining the same processes repeatedly. It offers a much clearer communication format than lists of instructions in text and can be centrally posted so the entire class can see it. It is also a quick way for students to demonstrate they understand something, and for teachers to discern how well they have learned it. This usually takes the form of the ubiquitous "PowerPoint presentation." The performed PowerPoint presentation is a rich media collage that adds a new element: you. While it can be submitted as a file, it usually accompanies a live presentation that delivers a lesson, a project presentation or other informational session. Live performance. Performance literacy (Dillingham) is particularly important here, as is oracy. Timing, articulation, clarity of voice, pacing, sound, motion and expression, etc. all come into play here. Big screen media collage display. Much of what we look at on the web happens on a small screen in front of us. In contrast PowerPoint presentations happen on a large screen in front of an audience. This brings a special sense of urgency to creating a media collage that works. Coordination of prepared media and presentation. This is an art in itself. What do I say vs. what do I show? How to I align them? Opportunity to record and self-assess one's presentation. Recording oneself is one of the most powerful teaching tools in the pedagogical took box for anyone who teaches, trains or makes presentation. Athletes and performers use it, why not teachers? Storytelling vs. reciting. Is it important to you that your students tell a story rather than read what is on the screen? Is it important that they turn what is on the screen into a story rather than a report? Performance with digital story background. Dana Atchely, one of the primary founders of the digital storytelling movement, used to perform and tell stories while a digital backdrop ran in the background. Rather than informational slides, he used actual scene changes he created with his computer. One of his most celebrated pieces, Next Exit, can be seen online. It is easy to imagine school work in this form in many content areas. Green screen storytelling. Students create and tell a story in front of a green wall or sheet, and then add images and video behind them, a la the Matrix and the local weather announcer. This process is inexpensive and simple to do these days. The results are always at least interesting and often amazing. To see an example of this, watch Hannah's performance of Fox Becomes a Better Person, created by a 4th grader as part of a cultural literacy course. Second Life. Classes are already meeting in Second Life, the virtual reality available via www.secondlife.com. It offers a very new take on performance, because inhabitants are represented by avatars that walk, talk, interact, build virtual objects, form communities, create schools, attend classes, and so on. Presentation without live performance or voice narration. PowerPoint and other presentation media can be used without live presentation. Future of Technology by Scott McLeod is an example. It uses music but no live presentation or voice narration. Web 2.0 - the Machine is Using Us is a good example of presentation using a number of media, including overhead camera, web cam, and screen capture to create a presentation. It also uses music but does not use live presentation or voice narration. Digital reports, documentaries and stories are technically similar. They use images, voice-over narration, music, video where appropriate, and the other common elements of the multimedia collage. The difference between them lies mainly in their internal structures. The student education philosophy media projects featured earlier fall mostly into the report category because they are straightforward, linear presentations of the information they contain. Documentaries begin to assume internal structures and elements that story listeners are used to, such as the story core, tension-resolution, and transformation. Stories often use them very explicitly. This is covered in depth on the story development website. How to hitchhike, by Karen Aleksa. The storyteller passes on the lessons she has learned over the years as a hitchhiker. Johnny Knows Best, by Bill Winslow. A story about a student with attitude problems who comes to understand the value of good like skills and a good attitude. Our hero, Xaiver. A small town musician gets an opportunity to play in well-known band. In the process of preparing to join the band, he discovers there is no place like home. All of these stories were produced with "off the shelf" free software and common equipment. The focus was on story, not media production, yet they are work well as both. Certainly today's students are creating movies. YouTube is full of them. We distinguish movies from digital stories primarily in terms of the presence of acting and dominance of people, vs. media, on the screen. At the beginning of this site I described the blogs that each of my graduate students maintained during the course of their study. The weblog functions as a portfolio and notebook, which either contains or points to work they have created. Work is stored and presented using a number of web services, such as YouTube, SlideShare.net and Google Docs. More information is available in the description of students at the earlier in this sit. YouTube features a number of media forms, all of which have potential for education. One of the most straightforward is the video essay. One I particularly like is Gullible is not in the dictionary by a high school student with the screen name AngryLittleGirl. She wrote the essay, and then gave an oral presentation of it in front of a web cam, presumably reading from the screen. It is a thoughtful, articulate look at "being gullible" and its implications in a world of information overload. Here is basic software information to get you started. Bear in mind that I cater to the low end; if you have the budget and the time needed to raise your expectations and production values, there is plenty of mid-range to expensive software out there to do so. But I make the assumption that this is not the case. Begin be creating your portfolio shell. I recommend using one of the free weblog tools available. As of this writing, there are a number of places you can go to create blogs. Two of the most common are Blogger, owned by Google, and Wordpress. Blogging software is largely platform independent - it works equally well on a Mac or PC. Just go to the website and follow the directions. It takes only a few minutes to create a basic portfolio. The writing on your web portfolio should be in Visually differentiated text (VDT) form explained above. VDT uses "the 7 Bs" - bullets, banners (paragraphs titles), breaks (white space), boldface, beginnings, beyond monochromatic text (color) and boxes. All but boxes are available in any standard blog editor. Boxes take a little HTML experience, so forget those if you are just beginning. The 4 Bs will be fine. While the blog writing should be in VDT form, reports and essays will continue to be part of the student portfolio. These should be attached using Google Docs or another service. Rather than post these directly on the portfolio (where they would go on and on for screen after screen), students should link to them from within their blog portfolios. Typically VONs are used to show how to do or use something on the computer. The software takes snapshots of what appears on your screen, and also records your voice. This allows you to narrate as you navigate. I included links to some VONs I have created above that show how to, for example, put a link within a blog entry. For the Mac: SnapzProX. Retail: $69. For the PC: Camtasia. Retail from an educational discounter- $180. There is also shareware that is available that will do this. The most popular, cross-platform package seems to be Jing. I have not used it, but it gets high marks from those who do. These software packages usually come shipped with the computer. If not, you can download them. Uploading to TeacherTube, part1: Signing up and uploading a movie. 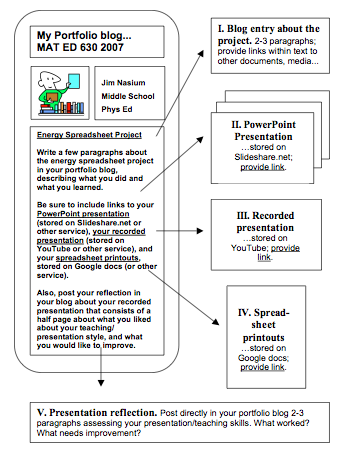 Uploading to TeacherTube, part2: Linking to your TeacherTube media in a Blogger blog entry. Uploading to another service, like YouTube, is going to be very similar. The defacto standard is certainly PowerPoint, though other options exist, like Keynote for the Mac. To store them I use Slideshare.net or GoogleDocs. Very straightforward. When your presentation is uploaded, you will be given a web address that you can link to from within your blog. Utterz. Allows posting from a cell phone directly to a blog. Utterz. Allows file sharing, collaboration, backups. YuuGuu. Allows sharing desktops, so virtual collaborators can see each other's screens. Recently students in a class of mine conducted energy conservation research on themselves. They chose some small facet of their energy consumption life, and compared it with alternative strategies to accomplish similar goals. Typical projects included: comparing riding the bus vs. driving a car to work, comparing using incandescent and fluorescent bulbs... even comparing baking potatoes in the microwave vs a convection oven. The results are always illuminating. A great deal, including podcasting, vodcasting, video essays (described above), and more. But the elements above constitute a good, solid "beyond words" portfolio entry. Good, clear expository writing. This will continue to be essential to new media production far into the future. This could come in many forms, including research, story treatments, scripts and other documents required in the media world. Whatever students produce, it must be clear, organized, and compelling. Traditional, oral storytelling. As video technology becomes cheaper and easier to use, we will see more oral storytelling appear in digital stories. Short movies. These will more resemble miniature movies, rather than storytelling performances. There is currently surprisingly little of this in the digital storytelling world, a fact that will change as technology and interest evolve. YouTube points the way in this regard. Gaming, interactivity, and participation. Games, including educational games, already have user-directed story components, a trend that promises to continue. We should expect increased interactivity and more multiuser digital stories in which the audience participates as both story listener and story creator. Green screen and other advanced movie techniques. We can expect students to want to use the same tools that are used to create the media they experience in their own lives, such as the use of green screen chroma-keying in “Fox Becomes a Better Person.” Green screening is just beginning. Whatever tools the entertainment industry uses will show up in education at some point in some manner. Animation. One of the advanced movie techniques that is becoming increasingly affordable and more common is animation. We should expect students to want to use voice-over animation, looking much like scaled-down versions of box office hits such as Toy Story. We should also expect stop-action animation, using real people, Claymation, and other approaches. In addition, programs like Flash are making motion-based multimedia a very useful storytelling tool. School Train . A truly original multimedia collage that is hard to categorize. Students created it in response to a school assignment in which they had to demonstrate their understanding of the concept of metaphor. Their piece compares and contrasts riding on a train with going to school. How to Make a Rolling Ball. This explores the mathematics of what makes a ball roll. This could have been just a report. However, the students included an early failed attempt and what they needed to do to correct it, which gave it a story line. Inclusion of original artwork and music. Copyright constraints, easy-to-use software like GarageBand, and the desire to create something truly original will compel student new media developers to include more and more original work. The eventual recognition of the importance of art and design literacy—art being the fourth R (www.jasonohler.com/fourthr)—will also help this along. This will include “semi-original” artwork, the domain of the mashup. Art stories. It was McLuhan (1964) who noted that new media are used to do the work of old media until we figure out what the new media offer the world of communication that is truly new. When we do, we verge on a new art form. One kind of digital story that promises to increase is—for lack of a better phrase—the art story. I don’t mean artistically told conventional stories, but truly new creations. We can guess what these might look like, but in many cases we don’t know what they are until they arrive. Increasingly, art and media classes will look to the digital storytelling format as a canvas, voice, and stage. VR, holography, haptics, and other advanced technologies. As I noted earlier, I know only one thing about the technologies that await us in the future: we will find ways to tell stories with them. Every new technology that reaches a classroom will be used by digital storytellers. In fact, digital innovators who want to discover the capabilities of new software and hardware would do well to give it to digital storytelling students and ask them to create something with it. Advanced editing techniques. We should expect to see more video material in digital stories as it becomes cheaper and easier to use. While this is true, we should also expect technique creep. That is, what passes as acceptable edited video today won’t pass tomorrow. As our capabilities advance, so do our expectations. The result is that the leading edge becomes clique very quickly in the tecosystem, Editing as an art form will continue to grow, much as it has in print media. Also, keep an eye out for self-editing technology that will adjust images on the fly to make you look better or make your story look, ironically, more realistic. Distributed, collaborative, shared media, stories and story spaces. The Internet provides an international stage for digital storytellers and new mediasts. As it morphs into Web 2.0 and beyond, it also facilitates interactivity and participation locally and at a distance, allowing students to share and collaborate on digital stories. A special form of distributed, shared media and stories will occur in story spaces, specialized electronic communities that specialize in storytelling. They will be facilitated through the use of avatars and other virtual representational entities, This is already happening to some extent and will continue to grow in popularity. We should also expect projected “real” performances using video techniques such as green screening. “Beam me up” may be ways off, but “project me there” is already here. Role blur. Podcasting suggests that the same thing will happen to new media developers that has happened to artists and musicians: the division between artist, producer, and distributor will blur beyond recognition. While role blur gives artists more to do, it also gives them more control over what they do and how they distribute their work. New media development becomes the entire process, from conception to development to distribution and performance and everything in between. A good story. All of the technology that is coming down the pike should be both exciting and worrisome. With each advance in digital storytelling tools, we also advance our ability to say less with more. Beginning with a good story will become more important than ever in digital storytelling. Telling stories effectively, regardless of the media, will be crucial. Within our classrooms, it will be up to teachers to help students ensure the technology serves the story and not the other way around.